"A blend of spinach and three-cheese tortellini and marinated artichoke hearts. A perfect summer side dish or main dish! 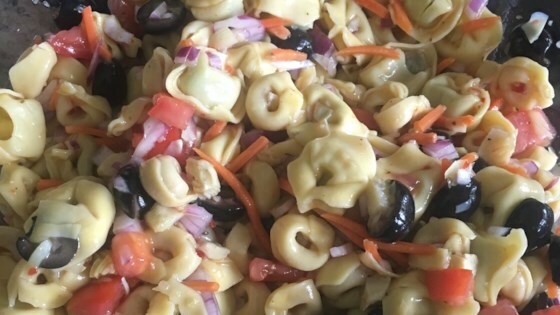 Try my Lite Italian Salad Dressing recipe with this salad!" Love this, added feta cheese crumbles and it was soooooo good! This recipe is fantastic. I added shredded mozzarella cheese and thin slices of salami. I'm taking this to a baseball team party tonight. I am a young married college student with a nutrition major and this was the perfect recipe for me and my husband! We served it for guest and they all enjoyed it. Then we took it to a group meeting and everyone liked it. We used Olive Garden Salad dressing.